Sticky-sweet grilled pineapples are delish on their own, but placed atop a fluffy cream cheese tart, they create a dessert to remember—and recreate! Microwave butter in large microwaveable bowl on HIGH 30 sec. Add marshmallows; toss lightly. Microwave on HIGH 1 min. or until marshmallows are completely melted, stirring after 30 sec. Add cereal; mix lightly to coat. Press firmly onto bottom and up side of lightly greased 9-inch tart mold or pie plate to form crust. Beat cream cheese and ginger in small bowl with electric mixer on medium speed until well blended and creamy. Add whipped topping; beat on low speed 1 min. or just until blended. Spread mixture evenly over crust; refrigerate. Lightly grease grill grates. Preheat grill to medium-high heat. Cut each pineapple quarter lengthwise into 1/4-inch slices; place in medium bowl. Sprinkle sugar over pineapple slices; mix well. Let stand 5 min. Place pineapple on grill; cook 2 to 3 min. on each side or until tender. Cool completely. 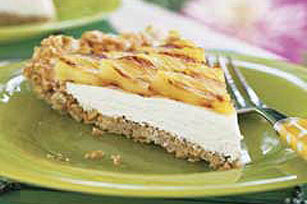 Arrange grilled pineapple slices over chilled tart to serve. Buy pineapples that are slightly soft to the touch and show no signs of greening. The stems should have a sweet smell. Crust can be made a day ahead and kept wrapped at room temperature. If filling is made ahead it should be kept covered and refrigerated; let stand at room temperature for 20 min. or until softened before spreading over crust. When cooking on charcoal grills, allow 30 to 40 min. for the lit coals to heat up before cooking. The coals are ready when covered with a fine gray ash. If the fire is too hot, use tongs to spread out the coals. Or, for a hotter fire push the coals closer together. When cooking on gas grills, preheat the grill for about 10 min. on high heat before using. Then, adjust the heat as directed in recipe.